If there's no local farmers' market nearby or you are struggling to justify the higher food prices of organic produce flown from the other side of the world, then the idea of a fresh organic bundle of food delivered to your door every week is probably quite appealing. Most box schemes value seasonal, local produce. Some allow you to be picky and offer different box sizes, which obviously influence the price. Be wary of the big supermarket chains - even if produce is selected from local resources it's likely food has travelled to a packing and distribution point and back to the local area. Rivernene, Riverford and Riverford Norton also pride themselves on zero air miles and organic certification by the Soil Association. These three companies are linked but primarily use produce from their respective farms: Home Farm, Wash Farm and Upper Norton Farm. You can order from throughout most of the UK. They sell meat, dairy, soups, herbs, wine, juice, tofu, cereals and neat BBQ packs. Fruit and veg boxes are sold separately. 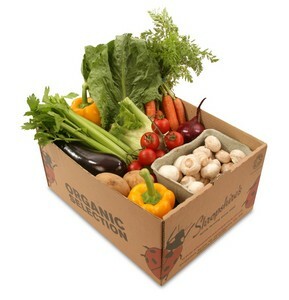 A medium box of organic vegetable costs £13.65 and includes a selection of ten different types of vegetables. Abel and Cole have the zero air miles stamp of approval and are certified organic by the Soil Association. They Best Organic Home Delivery Service at the 2008 Natural and Organic Awards. Beyond fruit and veg you can also buy meat, fish and poultry, herbs and spices, oil, bread, cereals, honey and other spreads, soup, sweet treats, even baby food. They even deliver Fairtrade bananas, chocolate and coffee - none of which are air freighted. You can buy a mixed medium organic fruit and veg box for £15.95 which includes six types of easy-to-cook vegetables, three types of organic fruit, plus potatoes. The Organic Delivery Company the name of the farm where each specific piece of fruit and vegetable is grown, for example the celery is grown by Pam in Strawberry Field, Norfolk and the leeks are grown by Langridge Organic in Devon. Beyond fresh food you can also buy vitamin supplements, pet food, even a kitchen waste composter. A medium organic fruit and veg box costs £14.95 and includes eight types of vegetable and four types of fruit.